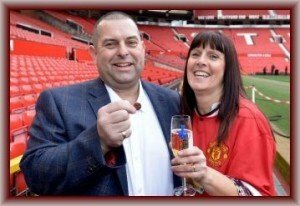 Sean Lloyd, a 48 year old man from Ashton-under-Lyne, not only won the lottery, but he gives full credit to a lucky penny he spotted on the ground. He was entering a store in Oldham to buy a lottery ticket when he spotted a penny on the ground. He picked up the penny for luck, and then went inside the store to buy his lottery ticket. After purchasing the ticket, he rubbed his lottery ticket on his new found lucky penny. Later that night, he decided that he would check the winning numbers before he went to bed. The first thing he noticed was that he had all five numbers, but when he suddenly realized that he had the bonus number as well, he let out a scream. He wife had already gone to bed, so he rushed upstairs to wake her up to tell her what had happened. Later he called his son, and they met for a few drinks. The lottery winner did not get to sleep until four in the morning. A bus driver by trade, Sean Lloyd is a husband, and a father of four children. However, after winning the lottery, he handed in his notice and will no longer drive a bus, deciding to take an early retirement. With his new found wealth, his first order of business will be paying off his mortgage and other debts. After this, he plans on taking his family on a vacation. He was one of eight people who won a total of £1,804,955 in the quadruple rollover lottery pot. The winnings were for five out of six numbers with the bonus number. No one had all six numbers. Like many other lottery winners, Sean Lloyd has stated that he will continue to play the lottery.